We have selected a few more children's books. Most of these books, or similar books can be obtained from bookstores in the Philippines. 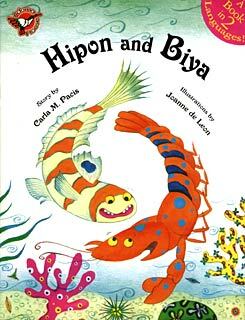 Hipon and Biya (Shrimps and Goby Fish) as told by Carla M. Pacis and illustrated by Joanne de Leon. This colorful illustrated story books tell us about two different sea creatures that are and helping each other. Hipon has such poor eyesight that he can't see clearly the incoming predators. With the help of Biya (volunteering to be Hipon's body guard), he was able to escape from harm. Hipon provides Biya with food and shelter, while Biya gives Hipon the protection he needs. With this amazing partnership shows us that no matter how different two creatures may be, they can still find ways to help each other out and live together happily ever after. Written in both Tagalog and English. Published by Adarna House, Quezon City. ISBN 9789715082389. 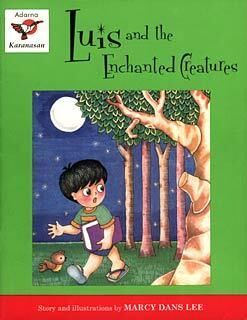 Luis and the Enchanted Creatures. Luis and the Enchanted Creatures as told and illustrated by Marcy Dans Lee. This colorful illustrated story book contains the well-known Filipino mythological creatures such as Kapre, Tikbalang, Tiyanak, Nuno (dwarf), Aswang, and Batibat (a snake-like creature that lives in trees). A boy named Luis has a strange adventure with these mythological creatures in a different light. These creatures appear not as bad and hideous monsters, but as lovable and funny characters in a neighborhood with the most seemingly dangerous turning to be the weakest and most vulnerable. This story is ideal for children who have a great fear of the mythological creatures that have found a permanent niche in the Filipino consciousness. Written in English only. Published by Adarna House, Quezon City. ISBN 9789715082617. 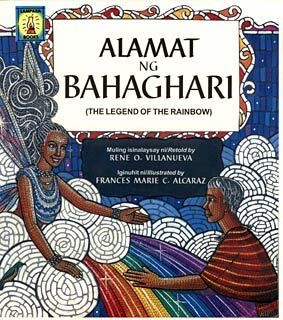 Alamat ng Bahaghari (The Legend of the Rainbows) retold by Rene O. Villanueva and Awardwinning children's book illustrator Frances Marie C. Alcarez with her mesmerizing mosaic drawings in the book. This is an popular Igorot Folktale from Northern parts of the Philippines about the legend of the rainbows. A charming story depicting a man's great love for his wife and son. Written in Tagalog and English. Published by Lampara Publishing House, Manila, Philippines. ISBN 9715180221. 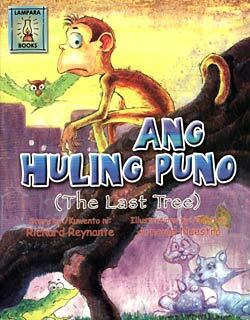 Ang Huling Puno (The Last Tree) as told by Richard Reynante and illustrated by Arnould Nuestro. A colorful comic-like book. This story is about the last tree in the city where Animals lives and children are happily playing around. This tree is plan to be cut down and build a huge building on it. To prevent them from cutting the tree, the animals and children are working together and come up with a plan. This story is motivating children to keep their role as a guardians of nature and as environmentalists. Written in Tagalog and English. Published by Lampara Publishing House, Manila, Philippines. May Leon sa aking Dibdib. 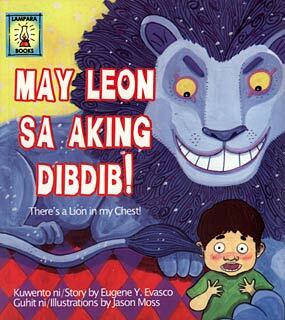 May Leon sa aking Dibdib (There is a Lion in my chest) as told as by Award-winning writer Eugene Y. Evasco and illustrated by Jason Moss. This story is about a boy having asthma that sound like a growling lion. Written in Tagalog and English. Published by Lampara Publishing House, Manila. ISBN 9715180469. 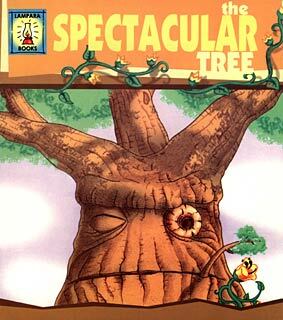 The Spectacular Tree as told and illustrated by Robert Gunnar Magnuson. This story is about the young climbing plant who wanted to grow as tall as Acacia tree but he is not growing straight up to the sky. With his help we was able to make the hopeless Acacia tree into an spectacular tree! Written in English and Tagalog. Published by Lampara Publishing House, Manila. ISBN 9716098405. 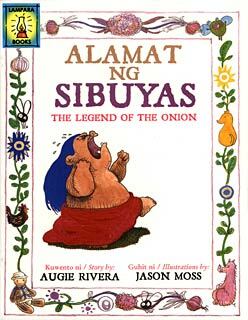 Alamat ng Sibuyas (Legend of the Onion) as told by Award-winning children's book writer Augie Rivera and illustrated by Award-winning children's book illustrator Jason Moss with comic like illustrations. This book contains the story of a naughty little girl named Sibuyan who always faked her cry whole day and night whenever she did not get her desires fulfilled, or just wanted to be noticed. But she is punished by a goddess. Written in Tagalog and English. Published by Lampara Publishing House, Manila. ISBN 971518006. 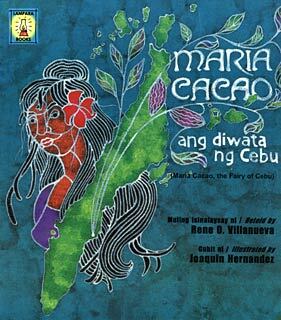 Maria Cacao, Ang Diwata ng Cebu (Maria Cacao the Fairy of Cebu) as retold by Rene O. Villanueva and illustrated by Joaquin Hernandez. This Cebuano folklore tell us about the Fairy in Argao, Cebu. Written in Tagalog and English. Published by Lampara Publishing House, Manila. ISBN 9715180302. I love your work. I'm also an illustrator and I did an exhibition for Philippine legends and did illustrations for "alamat ng pina, kasoy, saging, sampaloc lake and maria makiling" and I'm hoping to apply for a job as an illustrator. Hoping to get a feedback from you thank you. your comments on "Philippine Children's Books (Part 2)"